The most frequent question I get asked is ‘how do you grow and keep your nails so long? !’ or, ‘how can I get longer, stronger nails?’. Now, comparatively speaking my nails aren’t nearly as long as some people’s, but I guess by ‘average’ standards they are pretty long. I just like them that way – my fingers are stubby so if my nails are short I have a bit of a fear that they look like sausages. Anyway, I think my nails are just naturally quite strong but there’s a few key things I do to keep them that way. One of those is the religious use of hand creams – but I’ll get to that soon. As I said, my nails are naturally pretty strong – especially the ring finger on my right hand. I broke this one when I was young and the nail fell off (barf) and the one that grew in its place is honestly like diamond, it never breaks and when I need to trim my nails it’s quite a tough one to clip. However, I can’t say I recommend breaking all 10 of your digits to get strong nails ;-)! I’ve never used any strengthening treatments – the likes of OPI Nail Envy etc – so I can’t comment on how effective they are but I know some people swear by them and some people reckon they do nothing. I know what works for me though, and that I can share with you! I think a lot of the secret to longer, stronger nails is keeping them well hydrated. Dry nails become brittle nails, and brittle nails peel and break very easily. Now, strictly speaking, the very best way to get moisture into your nails is with inexpensive household products, specifically things like olive oil and coconut oil. I use olive oil after a manicure – I keep some in a dropper bottle to pop on my cuticles straight after painting my nails. When my nails are dry, I massage the excess oil into my cuticles. Coconut oil is something I use by proxy when I wash my hair – I massage coconut oil into my scalp for a good 5 minutes before washing it so my nails get a good hit of it too! Some people don’t like the feel (and slight inconvenience) of using oils – and that’s fine – that’s where hand cream comes in! I never used to use hand cream at all but about a year ago I found my hands becoming particularly dry so tried to start using it regularly. It’s become second nature to me now, and I religiously use some when I get into bed. I’ll often use it earlier in the evening too, when sitting round watching TV or YouTube videos. I even keep one in my bag and use it on my journey to and from work. It’s soothing and it passes the time, so why not? And I’m convinced its been doing my nails the world of good. I give myself a good old hand massage each time I use hand cream, paying particular attention to the fleshy bit below the thumb, the fingers and the nail beds – this way ensures you’re paying enough attention to the nails. It also really relaxes your hands; you’d be surprised at how many knots you can feel in your fingers after a stressful day! Pictured above are three of my favourites – learn a little more about them below. 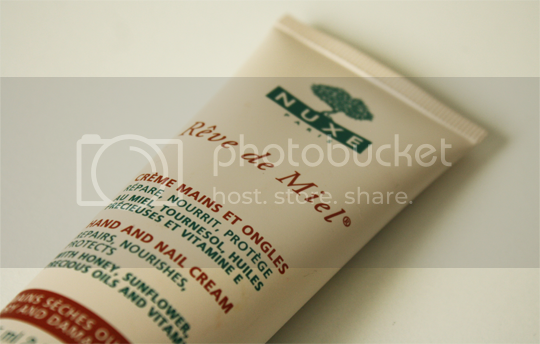 Nuxe Reve de Miel Hand & Nail Cream – I got really into the Reve de Miel range recently so it was only a matter of time before I bought the hand cream to match my other favourite bits. A little goes a long way with this one so be careful not to squeeze out too much. Provided you don’t use too much, it sinks in nice and quickly so it’s a good one to use on the go. In fact, it’s the one I keep in my bag for impromptu train journey hand massages. Get it from Escentual at £10 for 75ml. 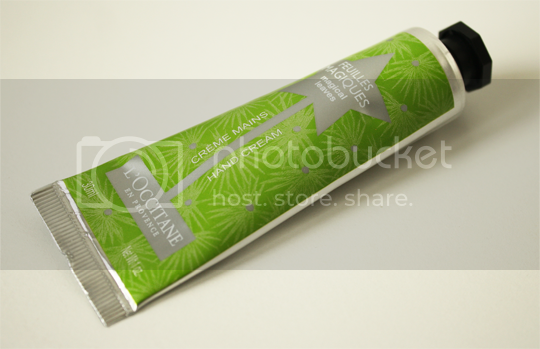 L’Occitane Magical Leaves Hand Cream* – Sadly you can’t get this particular scent anymore at it was a limited edition last Christmas, but I would happily recommend any of L’Occitane’s hand creams any day of the week. They all smell delicious and feel genuinely hydrating. They don’t take too long to sink in (but they aren’t super-duper fast) – this is the best one to use during idle TV watching! Get one from L’Occitane at £8 for 30ml. 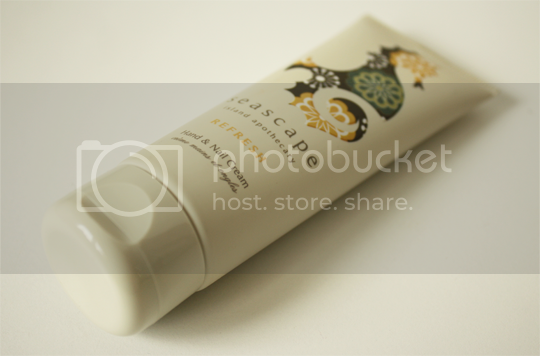 Seascape Refresh Hand & Nail Cream* – I love this Jersey brand. I’m not sure this should be called Refresh though – more like relax! This is the ultimate bedside companion – it has noticeable notes of lemongrass and geranium but the big hitter is Jersey lavender which really helps me to drift off to sleep. It can take a while to fully sink in which also makes it suited to the betime ritual, but I don’t even mind because it smells so good. Get it from Seascape Island Apothecary at £10 for 75ml. :: Never, ever, EVER do any cleaning or the washing up without rubber gloves on! :: Wear nail polish as often as possible. The extra layers will obviously add strength to your nails. :: Rub olive or coconut oil into your cuticles as often as you can. 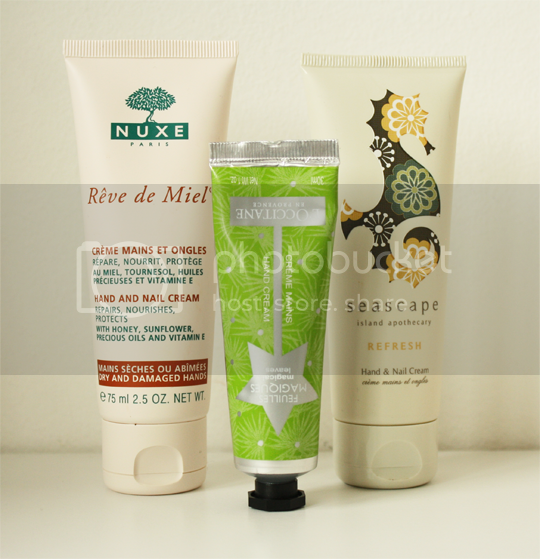 :: Hand cream is your new best friend. Try to use it before bed, while sitting idle, or on public transport. :: Nails are made out of the same stuff as your bones and teeth, so calcium helps; make sure you’re getting enough in your diet. I really hope that was helpful. It was written in a bit of a rush so please do let me know if I could have worded anything better. And if you have any of your own tips and tricks for longer, stronger nails please do let me know below and I’ll add them to the post!